How will having a child with autism in the family negatively affect my typical child? Each child and family is different so one cannot provide a global answer. However, the following interventions will help to diminish stress and promote positive adjustment: providing the typical child with education about autism throughout his or her lifespan, opportunities to share positive and negative feelings, opportunities to meet other siblings and families with children with autism, activities outside of the developmental disabilities community, special time with parents, skills to interact with their siblings and if something were to happen to the parents, a plan for the care of the child with autism. How do I describe “autism” to my typical child? The description depends on the developmental level of the typical child. For instance, preschool and early elementary aged children are usually satisfied with a description of behaviors their brothers/sisters exhibit. For example, a parent could explain that the child with autism does not like change, or his clothes bother him, or she cannot talk, or it makes her feel better to pace back and forth. As the typical child ages, the descriptions, explanations, and vocabulary can become more detailed and specific. One way parents can determine if they have provided enough information to the child is to look for the “glazed over eyes.” If you see this expression, you have said enough. You may also gauge what you say by the questions presented by the typical child. Inform the child that he or she is always invited to ask questions about their sibling’s special needs. No. You cannot catch autism like you catch a cold. Children with autism are born with their special needs. Parts in their brains work a little bit differently than other people’s brains and because of this, we see these behaviors. What should I do when kids make fun of my brother/sister? I don’t want to join in, but I’m afraid if I don’t, they won’t like me. This can be a tough one for kids. I have asked other children with siblings with special needs to help me answer this question. Their suggestions include the following: Even though they might not be your friends anymore, stick up for your brother or sister; Ignore the kids; Find a friend and stand up to the kids making fun of your brother/sister; Tell an adult you trust and ask for their help with the problem; Have your mom or dad come in and teach the class about autism. Video: Don’t Forget the Siblings – They Need Help Too! This talk describes the nutritional needs of siblings of individuals with autism. Kelly Barnhill, MBA, CN, CCN, is the Director of the Nutrition Clinic at The Johnson Center for Child Health and Development. She is a Certified Clinical Nutritionist, with over a decade of experience working with nutrition in children with autism and related disorders. At the Johnson Center she directs a team of dietitians and nutritionists that has served over 3000 children through this practice. 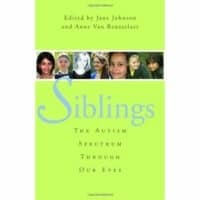 Learn more about the effect of autism on siblings and advocacy efforts around these relationships under our For Parents and Care Providers section.